NORDO News - Aviation Unedited: Will Your Plane Die With You? Mustang (right side, green and behind tree), and an XKE Jaguar (foreground). Below is something I posted on LinkedIn four years ago. It was forgotten to me until a friend recently referenced it. When a family member ended up being asked a very similar question from a homebuilder I decided I would place it here for you to read. Like it or not, there is a large segment of aviation rapidly approaching a turning point - a point where people do the tough things to help it survive or the easy things and let it go. What do you see when you look at this photo? 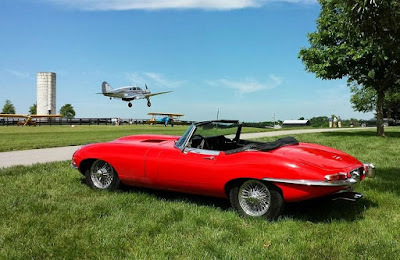 Most eyes land on the obvious; the blue sky, Piper Cub, Mustang convertible, Spartan Executive, and beautiful E-type Jag. Yet, what lies hidden in this image is a valuable lesson. The Cub tells us some things don’t lose their value as much as others, the Mustang reminds us that pure and simple are typically the best things in life, and the Spartan is a great example of how the prettiest things need constant polishing. But again, those things are obvious? What isn’t so easy to see is the lesson contained within that beautiful red Jag. Bought new by a gentlemen while overseas in the service, only recently did it change hands. When I saw it I stood at stared at its beauty. Imagine buying that at the dealership and still having it. So what’s the lesson? Well, look at it. It’s a dream on wheels. Would you want that car? If the owner offered it to you would you take it? I mean, if the guy who bought it originally were to call you up and say, “You know Fred, we’re like family and if you want the car you can have it”, would you say, “No”? Can you imagine anyone saying no to that? Well, here’s the thing, as it was told to me, that’s what his kids said. They didn’t want it; had no interest. But, up to that point he thought they would. That’s why he asked. Are you starting to see the lesson? That big plan of yours to give your vintage plane to one of your kids, well, it may be nothing but a fantasy. The fact they fly with you and have a pilot’s license is no different than kids who have a driver’s license and talk to you about your old car. Chances are really quite good that when the time comes they’ll not want it or to take care of it, and most likely would rather sell it. If it doesn’t make sense to them, it doesn’t matter how much it makes sense to you. But there’s more to this than your kids. This demographic shift will play heavily on the values and the future disposition of our vintage fleet(note: four years later it already has). For those of us who want the planes to be preserved and flown, this is something we must face head on and be willing to discuss. Do we want these planes to take on the role of rare cars that are trailered from one event to the next; only started for show? Is our number one priority to make a killing on the sale of them to a trophy room collector whose biggest thrill is overpaying at auction? Or, do we really believe the talk and are willing to walk the walk to keep them alive? If the later is you, the time is fast approaching where you’ll need to find someone you trust with the plane; an individual who would love the plane and keep flying it; a person who may not be able to pay you the full fortune you once imagined. I realize that’s a tough idea for many people, especially those from the parenting generation of “give your kids everything”. But, if you love that plane and want it to go to a home where it will be taken care of and flown on a regular basis, your kids may not be getting that truckload of money they fantasize about. Are you OK with that? Good, then there's one additional thing we need to discuss. What happens if you die without a thorough will? Do you trust your family to do the right thing with your plane once you've passed? If you don’t find it a home before you are gone it’s only going to cause problems for everyone. Even worse, your actions will have likely set the scene for disaster. Allowing your family to believe a vintage plane is worth a fortune, when it is not, is irresponsible. Yet, either by the owner's desire to believe it himself, or to convince family the money spent on the plane wasn't a bad investment, this belief is what most owners leave behind. Therefore, if this is your situation (don't fool yourself, this is likely you), once you’re gone the wife and kids will be looking to sell it as soon as possible to anyone offering top dollar. Unfortunately though, after you pass, what they believe they know about plane will be largely incorrect. That in turn means they’ll be left believing everyone is out to take advantage of them because every offer will seem like a low-ball. Next, brokers will show up and reinforce the notion of a high value in hopes of getting a big commission. The family will cling to these dreams, sign a contract, and hold out for that big payoff that never comes. Meanwhile they’ll be getting angrier and angrier as the low but realistic offers continue to trickle in. Then when they are at their wits’ end, they’ll do one of three things. One, they’ll let it go to some dreamer friend of yours who’ll truck it home and there it will sit. Two, and as hard as it is to believe, they’ll chose another resolution; they’ll scrap it or let it rot. Or finally, they’ll give it to a museum. This they’ll do because they can justify it in their minds as something you would like and also because they can get a highly inflated appraisal to help them with potential tax issues. And yet, none of these are good options if you’d rather that plane go to someone who’ll treat it like family and keep it flying the way you did. I know the subject of dying is a tough discussion. But, if you’re one of those people who have ever stated proudly, “I’m not the plane’s owner, but merely its caretaker”, then it’s time to think about who its next shepherd will be. Of course, there’s always the chance you merely latched onto this popular gratuitous statement as a way make yourself sound really deep and complex when asked about the airplane at fly-ins. If that’s you, people will remember your BS the same way people remember sports players who claim to do it all for their fans then take the highest salary they can find and move elsewhere. But, whichever of these people you are, and without passing judgment, I hope you’ll at least try to find a new owner that will keep the old bird flying. Leaving the decision up to your family, or looking only to get top dollar, will betray who you said you were and the airplane you claimed to love. So there you have it; the upbeat subject of the day. Nobody likes thinking about death. But, if you really are its shepherd I encourage you to think it through. Others may look at it and see nothing more than an object, but let’s face it - most of us know at least one airplane that feels alive to us. The decisions you make will determine if it lives. What did happen to the car? In addition to all the other things Pat Hartness has accomplished at Triple Tree Airdrome in South Carolina he is actively working to provide a unique solution to the problem you discuss. Someone with your insight, writing skills and unique perspective should visit Pat at Triple Tree to learn about his solution, see it in action, and write about it. The idea should be scalable all around the world. Tell Pat I said Hi!